Thanks Yota for sharing the article. I like this part Al-Qasabi said the kingdom would support the development of Iraq by one billion dollars. He explained that the amount will be allocated to support the areas that have been recently liberated from the terrorism and support the reconstruction of infrastructure services projects. WHY IS IT TAKING SO LONG TO REVALUE?!!!!!! According to Iraq's mineral ministry, country's western desert contains huge reserves of gold and likely platinum and diamond resereves. LONDON(BullionStreet): After decades of sanctions, war and sectarian violence, Iraq is struggling to maintain it's economy and looking forward to increase gold production along with oil and natural gas. According to Iraq's mineral ministry, country's western desert contains huge reserves of gold and likely platinum and diamond resereves. The Iraqi government recently announced a 30 year economic plan for mines and minerals by granting production licenses to foreign mining companies. The Iraqi government is thus hopeful that gold mining can be an increasingly profitable venture for the country. However, official gold trade in the country remained in doldrums as Iraq's banking sector required proper training and guidance from foreign banks, analysts said. Iraq's northern neighbor Turkey offered to support country's banking sector in gold trade. Turkish Banks Association (TBB) said the Turkish banking industry, which developed new ways of bringing in individual gold savings to the economy, will train Iraqi bankers on how to trade with gold. The scope of the training will be determined depending on the demand stated by the Iraqi government. The TBB has started a study in regards to the training, which will take place in Baghdad and Erbil following a recent visit by an Iraqi delegation of the Federation of Private Banks to Turkey. Analysts said Turkey has carried out important studies in trading gold, which is a significant saving tool in Iraq, and we want to benefit from Turkey's experience. TBB has provided training to countries such as Albania, Azerbaijan as well as Bosnia and Herzegovina and has also been working on training programs for Syria and Lebanon. Nice news!! Thank you for finding it and sharing it with us! they are waiting for you to throw in the towel, then they will RV. 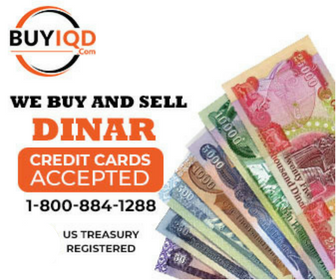 Committee economy likely improve the value of the dinar against the dollar after the central bank reforms. Thank you Yota for all your postings! Hi, yes i did send it. Desperate, no. Been in it for 3 years. Please share what you can do to help. Working proactive and asking questions is good. Many business deals and relationships are done this way. People would not be married if they did not ask. I could ask my friend who is a Consular of Thailand to write. Perhaps, coming from someone with government ties would be more apt to respond. I hope it comes quick, of course. A major reason being is1 child in 4 seconds dies just because of bad water or lack thereof. I hope many will help the poor with their money. The desire of a man to be kind, and charitable, and generous, is his kindness, and shall be so construed; both God and man will accept his good-will, according to what he has, and will not expect more. A poor man, who wishes you well, but can promise you nothing, because he has nothing to be kind with, is better than a liar, than a rich man who makes you believe he will do mighty things, but, when it comes to the setting to, will do nothing. Anonon and TFK, think before you speak The words of a wise man's mouth [are] gracious; but the lips of a fool will swallow up himself.